6626.34 kHz CW, "Rainy", ditter beacon, 19 milliseconds dit duration, 307 milliseconds repetition, weak readable, -117 dBm. 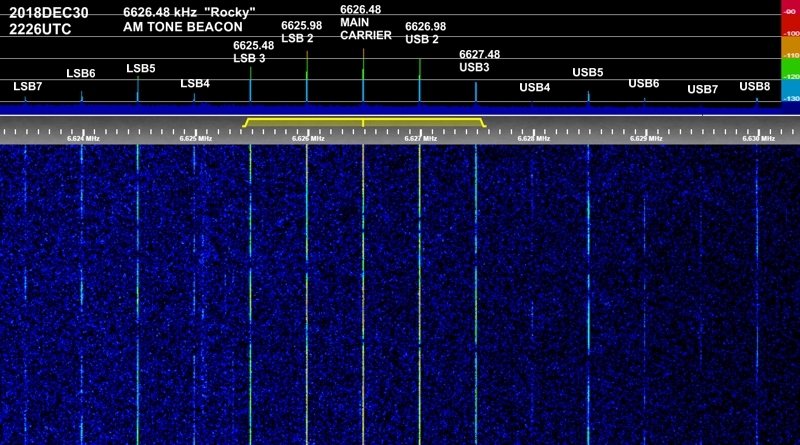 6626.55 kHz AM, "Rocky", tone beacon, 16.1 kHz tone modulation, weak readable -120 dBm. Ionogram image below shows the nearby Pt. Arguello ionosonde data at the time of the log report, 2018DEC09 2015UTC, with foF2=6.507 MHz and fxI=7.15 MHz. Probably, HexY2k offers the best chance to catch. On 6700.46 kHz CW, the HexY2k dasher beacon is by far the stronger signal among the 6 MHz beacons. Rocky is especially rare, because one can tune right past it, thinking it is just RFI carrier crud. They are never logged here at western USA night; perhaps all 3 of them require solar sunlight? Or maybe it is just due to the nature of propagation. If they are solar-only, and one is trying to predict a possible opening, remember that many of the western USA sites have sunsets that are shadowed due to the mountains or very high trees. So, plan to watch at least 1 hour or more before official local sunset at the beacon site. Highlight of this report: Rocky AM tone beacon audio harmonics. Image below shows modulation waveform of 6626.48 kHz Rocky AM tone beacon, an asymmetric sine wave with clipped bottom, 2018DEC30 2226UTC. 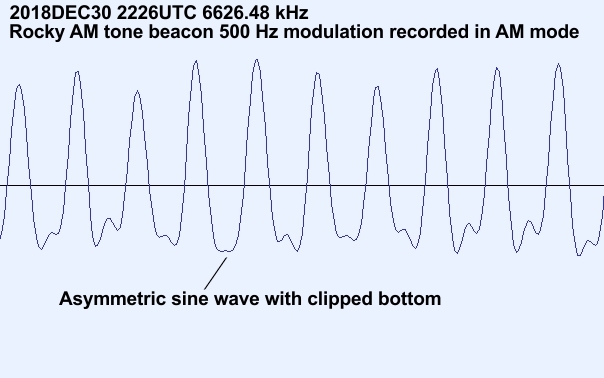 Ionogram image below shows the data from the nearby Pt. Arguello Digisonde at the time of the log report, with foF2=5.175MHz, fxI=5.9MHz, 600kmMUF=6.6MHz.